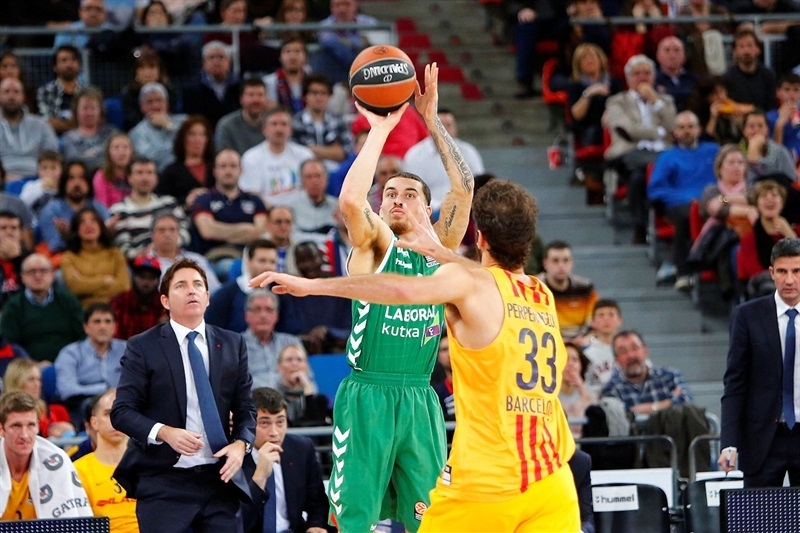 In an all-Spanish clash that opened Top 16 Round 12, Laboral Kutxa Vitoria Gasteiz held off FC Barcelona Lassa 75-71 at Fernando Buesa Arena on Wednesday night. 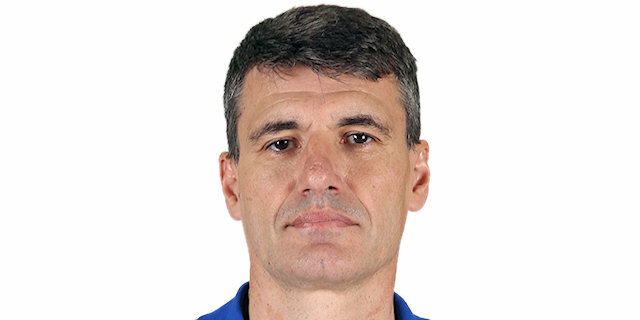 Laboral improved to 8-4 in Group F after sweeping Barcelona and Coach Velimir Perasovic’s side can qualify for the playoffs if either CSKA Moscow beats Brose Baskets Bamberg on Thursday, or Real Madrid defeats Olympiacos Piraeus on Friday. Meanwhile, Barcelona dropped to 6-6. The teams traded blows in the first quarter and a half, but Ioannis Bourousis and Mike James fueled a 15-3 run that put Laboral up by 9 points late in the second quarter and helped it to a 40-33 halftime lead. A 7-0 third quarter run pushed the margin to double digits, and James and Bourousis were at it again, increasing the difference to 58-45 early in the fourth. 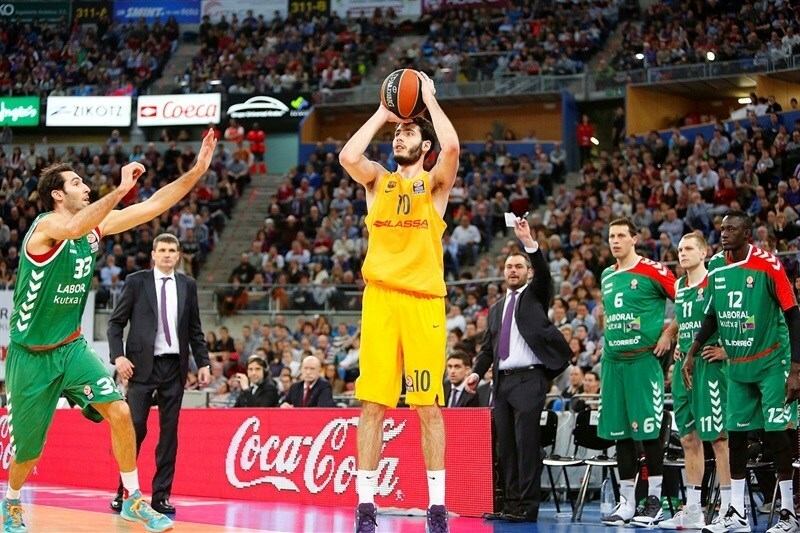 But Alex Abrines hit 3 three-pointers to cut it to 63-58, then a three from Stratos Perperoglou tied the game at 65-65. But the visitors never went in front, as Jaka Blazic and Kim Tillie made key baskets down the stretch to help Laboral hold on. Bourousis paced the winners with 22 points, 7 rebounds and 3 assists. 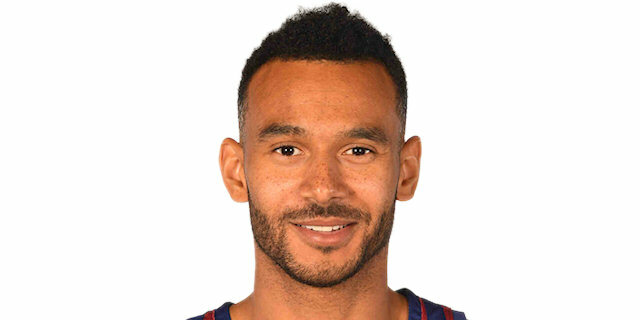 James had 14 points and 5 assists, while Adam Hanga contributed with 11 points, 7 rebounds and 2 blocks in victory. Tillie finished with 10 points for Laboral which played without its starting point guard Fabien Causeur. Tomas Satoransky had a career-high 20 points with 6 assists, and Abrines netted 13 of his 18 points in the fourth quarter for Barcelona. 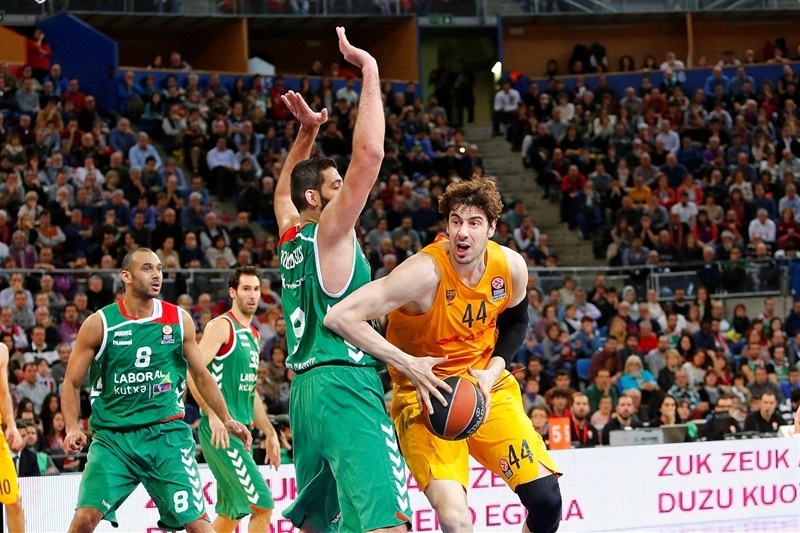 Ante Tomic had 10 points in the losing effort. 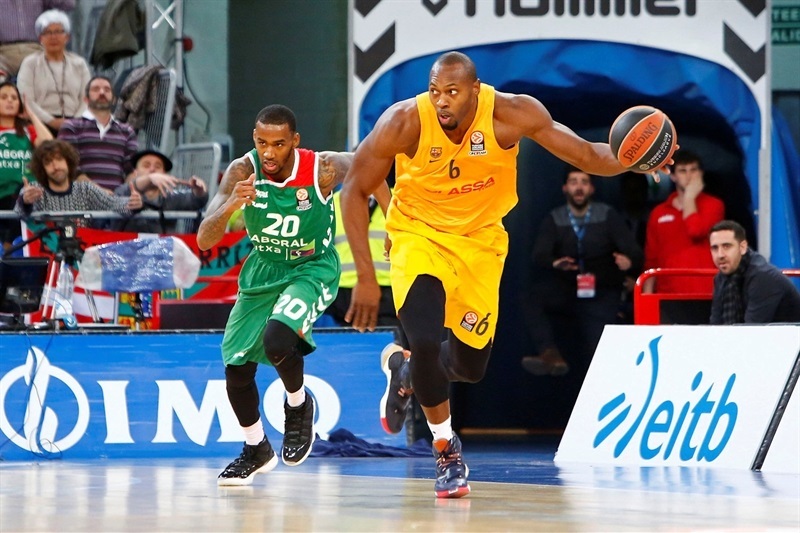 Adam Hanga opened the scoring with a pair of foul shots, and after Tomas Satoransky made a runner for Barcelona, Darius Adams hit a step-back triple to make it 5-2. 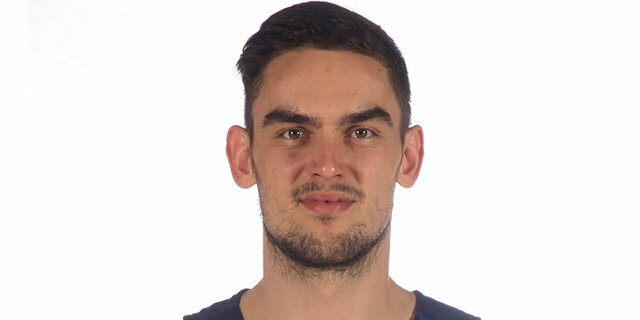 Joey Dorsey answered with a dunk, and after Darko Planinic fought for a put-back for the hosts, Satoransky scored from close range and Doellman on a fast break to give the visitors their first lead, 7-8. 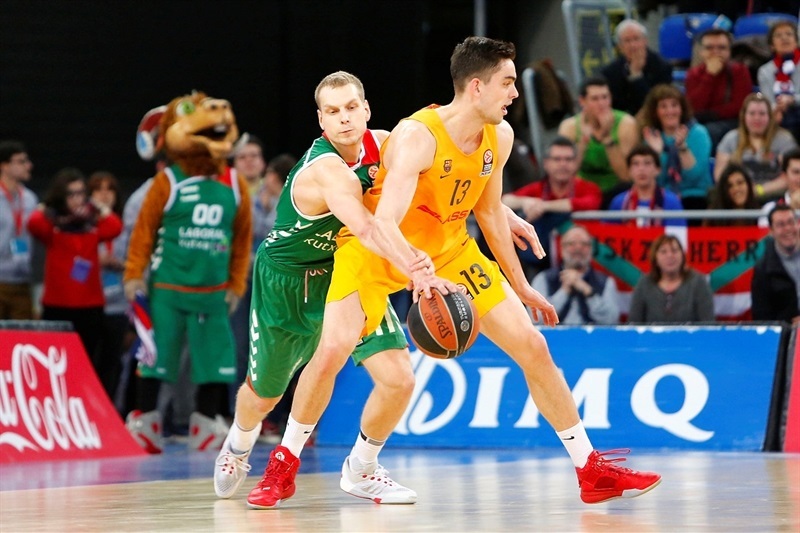 Kim Tillie drove the baseline for a layup, but Stratos Perperoglou hit a long jumper and Ante Tomic made one from close range to give Barcelona a 9-12 edge. The visitors kept Laboral scoreless for three minutes before Hanga took it coast-to-coast for a layup. Tomic and Ioannis Bourousis traded baskets from close range, and Carlos Arroyo and Mike James exchanged jumpers that made it 15-16 at the end of the quarter. 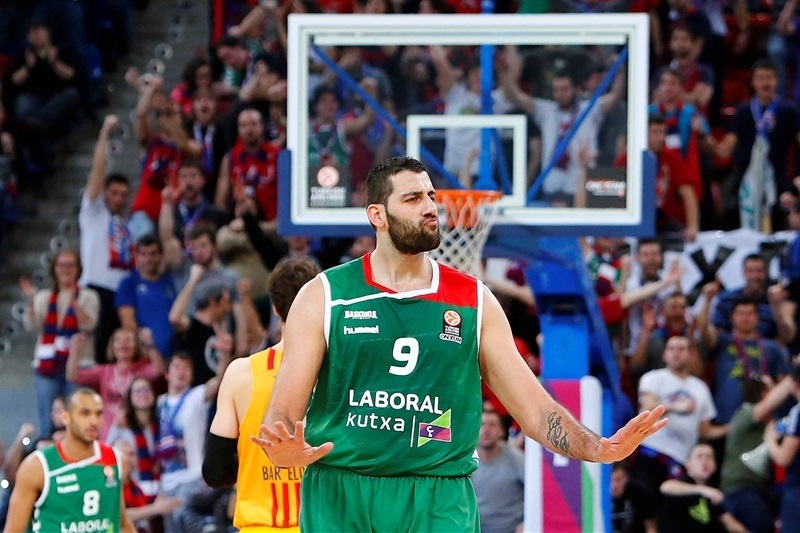 Bourousis hit a three-pointer, and after Alex Abrines nailed a jumper with his shoe on the three-point line, Bourousis made a basket inside to give Laboral a 21-18 lead. However, back-to-back threes from the same spot in the right corner from Satoransky and Abrines gave Barcelona a 21-24 advantage. After a timeout, Davis Bertans buried a three-pointer, but Satoransky had a quick answer with a running floater on the other end. After Doellman and James traded a pair of foul shots, Alberto Corbacho put back a free throw miss by Jaka Blazic, and a tip-in from Bourousis made it 32-28, prompting a Barcelona timeout. Hanga extended the margin with a three-pointer. Tomic banked in a shot for Barcelona, but James made a jumper and a triple to extend it to 40-31. Tomic made a baseline spin move to score inside again. After a scoreless final minute of the quarter, Laboral held a 40-33 halftime lead. Perperoglou opened the scoring in the second half by driving for a layup and Brad Oleson fed Satoransky for an easy two. Hanga went baseline for layup for the hosts, but Oleson dished it behind the back for another easy Satoransky layup to make it 42-39. 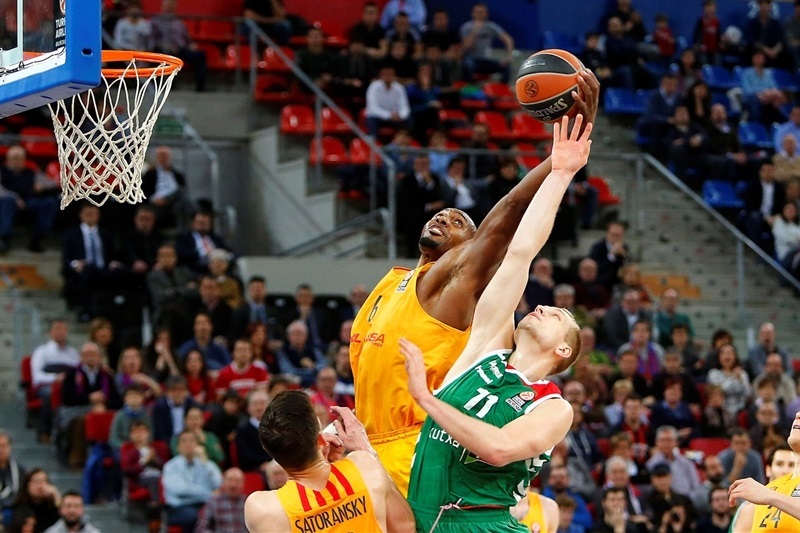 Dorsey had a big dunk for Barcelona, too, but Blazic made a jumper, James followed it with a triple, and Tillie battled for a tip-in and the first double-digit lead of the night. 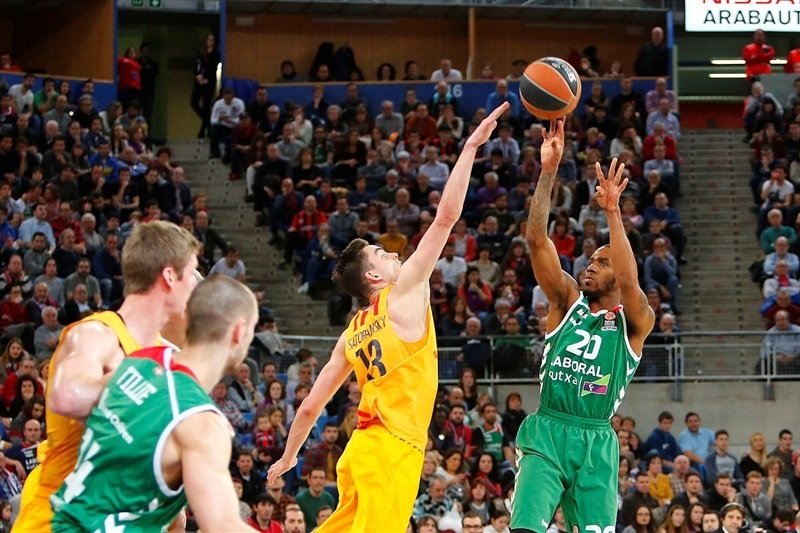 After a Barcelona timeout, Oleson hit a long jumper and Barcelona kept the hosts without a basket for almost three minutes. 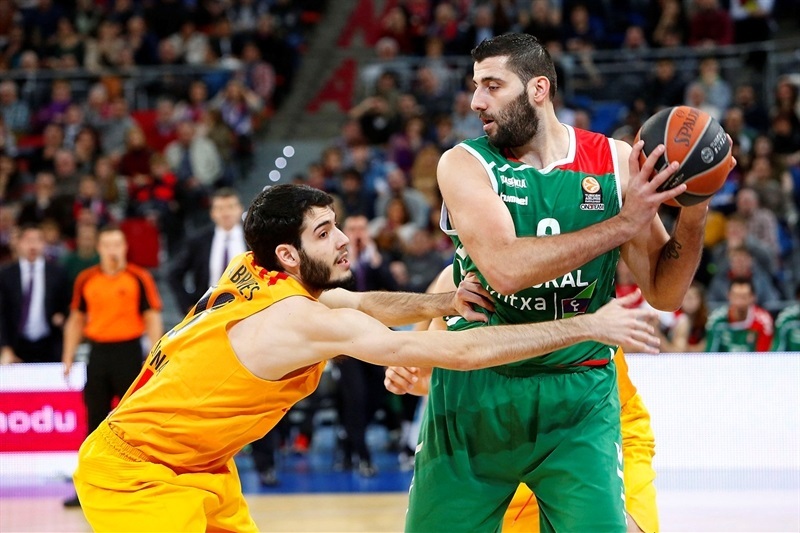 But Laboral kept getting chances with offensive rebounds, and an Abrines technical allowed Laboral to open a 54-43 with a huge dunk by Bourousis after an assist from James. Tomic scored inside on the other end, but James fed Bourousis again just before the buzzer, making it 56-45. James drove for a dunk, but Abrines nailed back-to-back three-pointers to cut it to 58-51. Bourousis nailed a triple and after Arroyo made a floater, Tillie scored from close range for a 63-53 advantage. 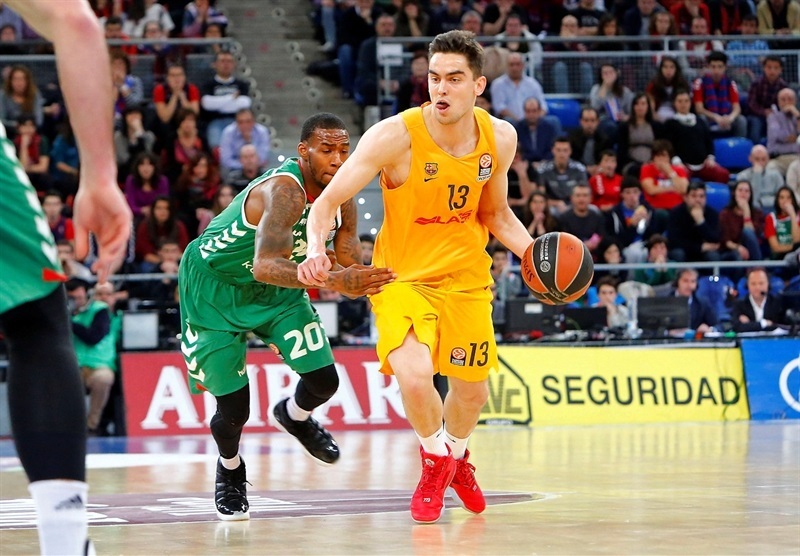 Laboral had a possession to increase the lead, but Satoransky made a steal and raced for a huge dunk before Abrines nailed his third triple of the quarter, cutting the deficit to 5 midway through the fourth quarter. 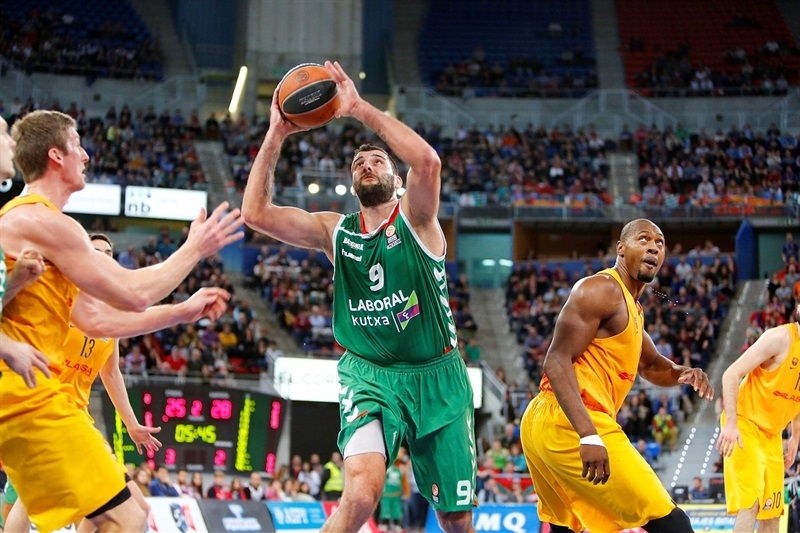 After a timeout, a Barcelona steal led to a layup by Oleson, but Bourousis made a quick answer on the other end. Satoransky hit a jumper, and Perperoglu a triple that tied it at 65-65. But Blazic immediately answered with a three-pointer. Abrines had a pair of put-backs, but Tillie scored four points, including a short jumper that made it 72-69 with 1:50 to go. Satoransky made 2 foul shots, but Blazic drove for a layup with a minute to go to keep Laboral’s margin at 3 points. The hosts made a defensive stand, and Hanga’s late free throw iced the win. "It was a very intense game; both teams had a lot at stake. All the work we have been doing so far in this competition is paying off. We are very close to getting to the next stage, but there are still two games and they are important. This win was important for us too because we came from a very tough loss at home. That put us in our place, as we have to know that if we won't give our best, we can get humiliated. I have to thank our fans because they didn't punish us after the game against Unicaja and supported us today in a great way. We played with a lot of energy and even though we committed some mistakes that helped Barcelona come back in the game, we managed to play calm in the end and get this win." 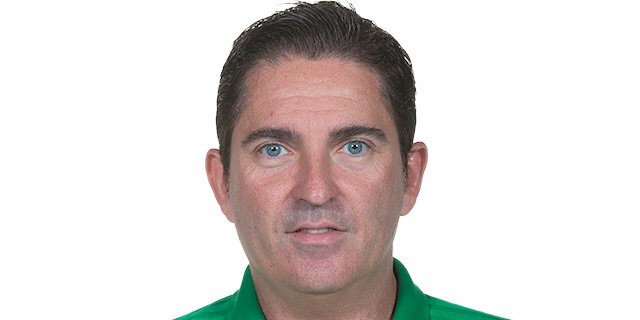 "I want to congratulate Laboral Kutxa for their win tonight. It was a very balanced game in the first quarter. In the second quarter we went through a bad moment that allowed them to build a solid advantage and enter the last quarter with a 7-point deficit. We were not effective in the last minutes, and committed a few defensive mistakes, missed some easy shots that prevented us from capping our comeback and winning the game." "I don't know what to say at this moment. We are very happy. Our target was to make it to the playoffs and we are now very close to achieving that. It's a big step ahead for us especially after the last defeat we got here against Unicaja. That shows we have character and pride. We must keep working as there are still two more games and we want to stay this way." "I think we lost this game because we were unable to play well for 40 minutes. We struggled both in offense and defense in some moments, even though when we found ourselves down by 10 points we managed to react and play well. In the end we committed some crucial mistakes at both ends, we didn't know how to play those minutes and the game was decided against us. "